V-ARMED creates custom 3D VR simulations for large-scale training. Our life-like multiplayer scenarios enhance mission readiness and situational awareness for defense, law enforcement, first-responder and engineering teams. V-ARMED is a subsidiary of Animated Storyboards Ltd., a leading supplier of motion capture animation and CGI, comprising a global team of 350 animators, gaming developers, engineers, designers, VR technicians and project managers. To visit our 7,500-sq. ft. (700 sq. m.) motion capture facility in NYC and view our multiplayer capabilities contact us. Our 16 years’ expertise in highly-realistic commercial-quality 3D animation, modeling, motion capture and AI technologies, translates into fast turnarounds and the capacity to deliver multiple projects simultaneously. 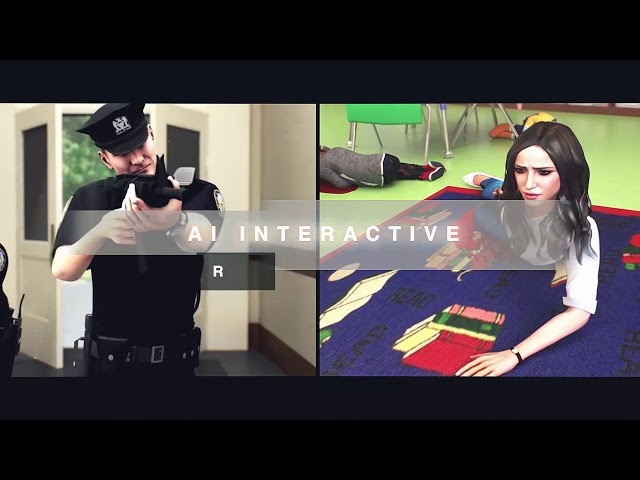 Synthetic graphics replicate real-life conditions, and 3D sound provides accurate situational awareness and communication with interactive avatars. Expert UX design and low-latency technology ensure nausea-free experiences, without compromising our high graphic resolution. We construct and operate your untethered experience at any location, supporting up to 12 trainees in one space, with off-site participants joining from remote locations, to enhance mission readiness and teamwork. We integrate full-body tracking, finger tracking and props, such as binoculars, maps and modified weapons, tailoring the best solution within constraints of budget, space or number of users. Operators can modify scenarios and AI behavior in real time, which results in unpredictable outcomes. Performance data and recorded sessions can be viewed from any POV. V-Armed “Active shooter” scenario takes place at an elementary school, offering a VR training experience that closely simulates active shooters or terrorist attacks in enclosed spaces. Get a glimpse of the future of armed forces training at our new large-scale motion capture studio in Brooklyn, and see how our cutting-edge technologies allow us to control scenario outcomes. V-Armed “Traffic stop” scenario takes place on a highway, where a driver is pulled over by a patrol officer, and the officer encounters a life-threatening situation. Our highly-realistic graphic and sound design, combined with conversational AI capabilities and modified weapons and flashlights, enable trainees to practice responses to routine license-check stops which could evolve into dangerous scenarios.